In recent elections, left parties garnered more than 50 percent of the vote and austerity took a major hit. In spite of a well-financed scare campaign, and a not very subtle effort by the European Union to load the dice in the October 4 Portuguese elections, the ruling right-wing Forward Portugal coalition lost its majority in Parliament, left parties garnered more than 50 percent of the vote, and the austerity policies that have paralyzed the country for four years took a major hit. Along with last month’s Greek election, it was two in a row for the European left. While most the mainstream media touted the election as a victory for Prime Minister Passos Coelho’s Social Democratic Party/Popular Party coalition, the rightist alliance dropped from 50.4 percent in the 2011 election to 38.4 percent, losing 28 seats. In contrast, the center-left Socialist Party picked up 11 seats, the Communist/Green alliance 1 seat, and the Left Bloc 13 seats. All in all, the left went from 40 percent of the vote in 2011 to a little over 50 percent in 2015. There are still four seats to be determined by the votes of expatriates, but even if all four went to Forward Portugal, it would still be short of a majority. And given that a flood of young, mostly professional, Portuguese fled the austerity regime inflicted on the country by the “Troika”—the European Central Bank, the International Monetary Fund, and the European Commission—those votes may well end up in the left’s column. The Parliament has 230 seats. The right now controls 104 and the left 121. A majority is 116 seats. The surprise in the election was that the Left Bloc more than doubled its representation, in spite of the fact that there were three left parties vying for voters. The right ran endless images of poor Greek pensioners lining up at banks, and warned voters that voting for the left could result in the kinds draconian measures the EU took out on Greece, but the scare tactics didn’t work. The Troika also eased up on Portugal before the election, exactly the opposite approach it took in Greece, even though Portugal’s debt is still high and its growth is anemic—1.6 percent this year. Unemployment has come down from a high of 17 percent, but it is still 12 percent, and over 30 percent among youth—those that haven’t emigrated. Out of a population of 10.4 million, some 485,000 young people emigrated from 2011 to 2014. In what one left-wing party member told the Financial Times was an “unseemly interference” in the election, Standard & Poor’s upgraded Portugal’s credit rating just two weeks before the election. S&P has long been accused of politicizing its credit ratings. Forward Portugal is already backing away from some of its more bombastic attacks on the left, and Coelho says his coalition would enter into “necessary agreements” with the Socialists in the future. Most commentators think the new parliamentary alignment is too unstable to last long. The question now is, can the left unite to roll back the four years of austerity that has impoverished the country? One in five Portuguese are below the poverty line of $5,589 income a year, and the minimum wage is $584 a month. Portugal has one of the greatest income disparities in Europe—the top 20 percent earn six times more than the bottom 20 percent—and education levels are among the lowest in the EU. But much of the left is not on the same page. Indeed, it did surprisingly well in the election considering its message was hardly consistent. The Socialist Party is still saddled with the fact that it instituted the austerity policies in 2011 when financial speculators in the rest of Europe drove up interest rates on borrowing. Contrary to the right’s charge, the debt was due to financial speculation, not spending. The Socialists also had a corruption problem, so voters turned to the right in the 2011 election. With an absolute majority in Parliament, the rightist alliance slashed wages, cut back pensions, privatized public property, and raised taxes. One of the few checks on the slash-and-burn assault was the Portuguese Constitutional Court, which blocked some of the more onerous austerity measures. In this election the Socialists ran against the austerity policies, but the message voters got was mixed: roll back austerity, but abide by EU rules. However, given that it was the EU rules that brought on the austerity, it was a message that voters found hard to decipher. The Socialists were also silent on the debt, a large part of which is of a questionable nature. The Left Bloc—which is close to Greece’s Syriza and Spain’s anti-austerity Podemos party—not only opposed the austerity, it demanded debt reduction. Indeed, without debt reduction—a so-called “haircut”—it is unlikely that small countries like Greece, Portugal, or Ireland can ever emerge from their current economic crises. After years of austerity, Portugal’s debt is still among the highest in Europe. The Communist/Green alliance did marginally better than in 2011, although the Left Bloc passed it for the first time. The Communist Party has a strong reservoir of respect in Portugal because of its long resistance to the 48-year military dictatorship. It has been a consistent opponent of the austerity policies, but so far it has shown little interest in working with the Socialists, which its leaders say is Forward Portugal light. The Communist Party calls for an exit from the eurozone, the 19 countries in the 28-member European Union that use the euro. While some on the left also want to leave the eurozone, the Socialist Party is committed to the common currency. However, there is agreement across the left around privatizations and cuts, and that the crisis in housing, education, and daily life—including food and medical care—has to be addressed. Without a majority, the right will have to back away from more austerity and plans to privatize some schools and public pensions. Does this election have reverberations outside of Portugal? The Wall Street Journal’s headline on the outcome was that it was “a cause for concern” for Spain’s right-wing government, which goes before the voters in about 10 weeks. But if there is one thing that the recent election in Greece made obvious, it is that small countries cannot take on the power of the EU by themselves. The European Union is now the single most powerful alliance of capital on the planet, and it is not a bit shy about crushing anything it sees as a potential threat. However, the Troika’s efforts to scare—and bribe—Portugal failed. In the long run, a common currency was a bad idea for everyone but Germany, Austria, the Netherlands, and the banks, but a quick exit would be like pulling a spear out of your leg—without careful preparations, you are likely to hemorrhage to death. While the ultimate goal should be to move away from the euro, the process may take awhile. One thing the European Union is vulnerable on is democracy. Being in the EU essentially means abandoning sovereignty. The recently signed agreement between the Troika and Greece says that the former can veto any policy it does not agree with, including anti-corruption legislation aimed at tax scofflaws. Essentially, democracy has become dispensable. Syriza and the Portuguese left successfully made this an issue in their campaigns, and it has great potential to become a pan-European issue. At the same time, there is potential danger with the issue of sovereignty, and the left must clearly distinguish itself from the xenophobic European right’s opportunistic adoption of the issue. Ronan Burtenshaw, vice-chair of the Irish Congress of Trade Union Youth Committee and coordinator of the Greek Solidarity Committee in Ireland, has proposed that the European left look to Latin America for a model. Mercosur, the huge Latin American trading block, is the third largest on the planet, but it doesn’t dictate economic policy to its members. The Bolivarian Alliance, ALBA, draws progressive countries into a political and economic union, and the Community of Latin American and Caribbean States has replaced the US-dominated Organization of American States. The Bank of the South offers development loans without the rigid strictures of the IMF and the World Bank. Latin America is a counter to the European mantra that “there is no alternative” to economic crisis and debt but austerity. Each country in the region developed its own way of turning away from the market-driven, austerity-laden “Washington Consensus” that blitzed economies from Brasília to Santiago during the 1980s and ‘90s. And the left played an important role in establishing continent-wide political and economic connections, specifically in Venezuela, Brazil, Argentina, Ecuador, and Bolivia. There are, of course, differences. Many in the European left contrast Argentina’s successful replacement of the dollar with the peso and its refusal to service its debt with Syriza’s acceptance of the Troika’s demands. But Argentina is a big, powerful country, self-sufficient in energy and food. Greece—or Portugal or Ireland—is neither. And while Argentina had support from other countries in the region, Greece stood alone, even from parties like the French Socialists and the German Social Democrats. Somehow the left will have to chart a perilous passage between resisting austerity, on the one hand, and not committing suicide, on the other—or rather, allowing the Troika to impoverish its base even more than it currently has. How that will happen is hardly clear, but solidarity is its essential ingredient, along with a willingness to work with others. The left will have to persuade or pressure center-left forces to abandon their romance with the euro and confront the social crisis created by austerity. Social democratic parties should take note that moving to the right does not translate into political power. 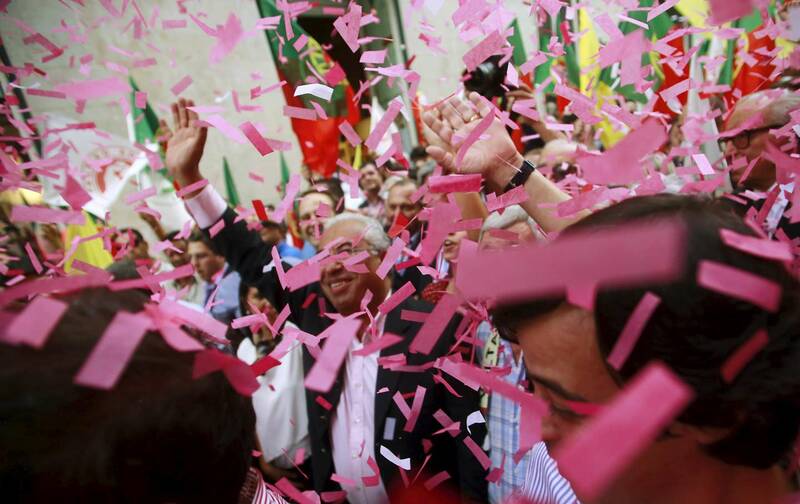 Syriza smoked the center forces in Greece, and the Left Bloc made the biggest gains in Portugal. To a certain extent, this process is underway with the election of long-time leftist Jeremy Corbyn to head the British Labour Party. In his speech at the Fete de la Rose this past summer, former Greek finance minister Yanis Varoufakis told the Socialist gathering that what the left in Greece had done was to give Europeans “a sense that democracy can change things.” Portugal was another step on that path, with Spain due up in December and Ireland in April. Conn HallinanFor more of Conn Hallinan’s essays, visit Dispatches From the Edge. His novels about the ancient Romans can be found at The Middle Empire Series.